"The Camp is Home for me. You need to understand that everywhere my family lives, people go out of their way to make it clear that we don’t belong - the landlord, the school principal, the police, the farmer. The Overnight Camp is the one place where people go out of their way to make it clear that I do belong. It is also the one place where I know that I will be every year.” –A young camper commenting on camp a few years ago. At first glance the camp seems like a typical camp, which is our goal. We want to offer a camp that would make anyone proud. We have swimming, canoeing, scavenger hunts, music, the arts and trips, but the camp is much, much more. To make it possible for the children to be children. Most come from difficult economic situations and face many barriers. As we mentioned above, they are forced to shoulder great burdens and the cost is often that they don’t get to be children. This camp is first and foremost about having fun. To live in community, especially in the midst of diversity. 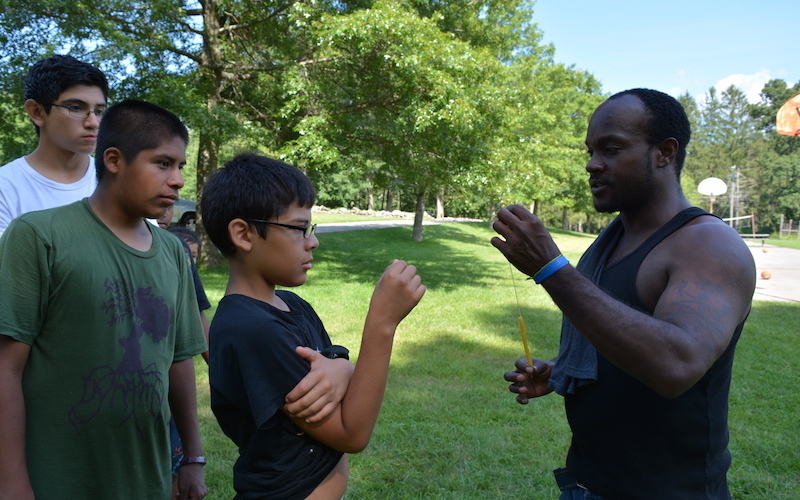 Our campers and staff come from a variety of cultural backgrounds. Often they arrive from situations of racial, ethnic, gender and age divide. The Camp looks to explore how to honor diversity and live in the midst of it – seeking opportunity and strength from one another. The camp truly is a diverse community with about 40% African-American, 45% Latino, and 15% European American campers and staff. To provide affirmation. Our campers are special! - and we want them to know that. In a world where they often run into barriers and negative feedback often rooted in racism, prejudice and adultism, our goal is to affirm and nurture. To nurture leadership development. At the Camp, campers are encouraged to dream, and in turn to examine the barriers they face in living out their dreams. Hand in hand with this exploration is a beginning examination of the issues, dreams and barriers that their communities face. Through role models, workshops and the arts we seek to help campers develop the basic skills they need. To increase resiliency. To counteract the effects of the barriers faced by our children, RMM provides a sense of purpose, a belief in a brighter future, a higher level of social competence, effective problem solving skills, a place where they have a voice, a positive identity and a sense of autonomy. Our youth benefit from opportunities to belong, a sense of mattering, caring and long-term relationships, high expectations, and opportunities for participation and skill building. 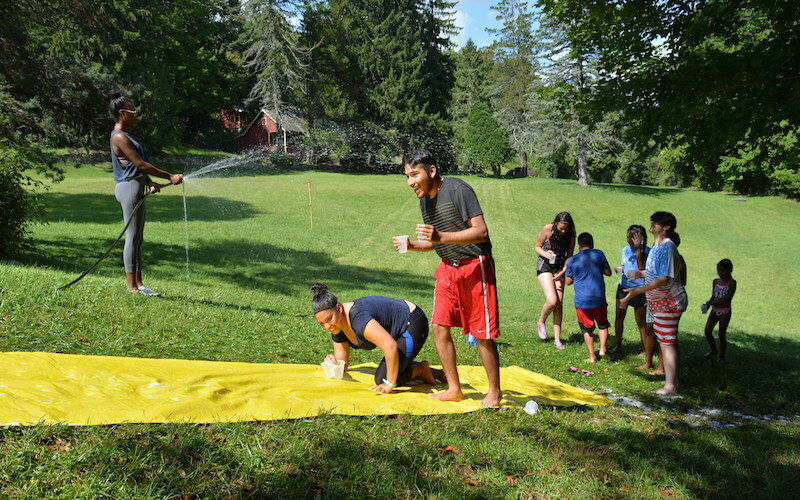 RMM's Summer Overnight Leadership Camp serves as a gateway to life-long positive leadership development. It is a sleep-away camp that meets for one week. 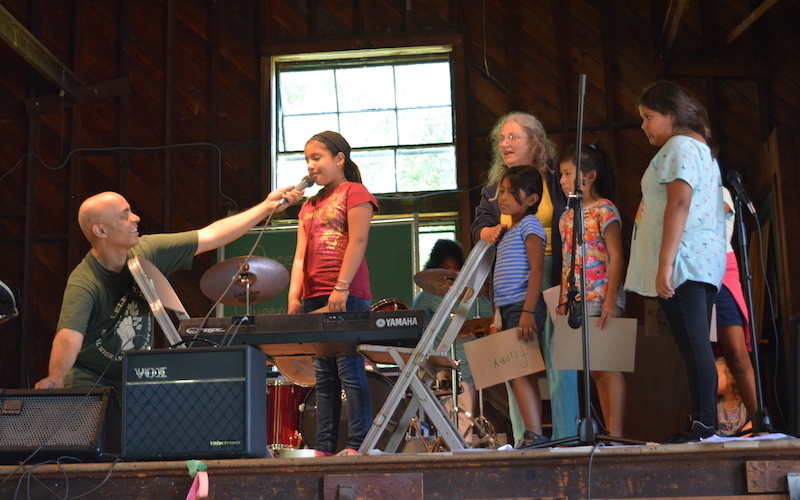 For the past few years we have hosted the camp at Holmes Presbyterian Camp and Conference Center in Holmes, NY. We usually host camp the third or fourth week of August. It costs us about $90,000 to host the camp and that is mostly room and board. Our counselors are all volunteers. Our camp directors are all professionals. We also utilize a remarkable group of professional artists-in-residence from across the United States. There are at least one hundred children ages 8-17. If we could raise more funds and find more staff, we could accommodate more campers. The camp is divided up into three age groups named Hope, Justice and Empowerment. Boys and girls sleep in different cabins. We do background checks on our staff and everybody receives Safe-Child Training. The Camp is theme-based, with a different theme every summer. In 2016, the theme is Words. In the morning, we begin with a hot breakfast, morning exercises and songs and then the three age groups divide up and go to a morning long program, each with a team of artists-in-residence. Following supper, there is 'Stoop Time' as the whole camp hangs out playing games or talking. Then there is an evening program where we welcome guest performers and speakers. Finally we bring the day to a close with Vespers, as we gather around a campfire and share stories, song, prayers and hopes. It costs RMM $900 to send each child to Overnight Camp. Donate towards a scholarship today.